For freshmen students of the School of Industrial Design, Halloween brought with it on more than just costumes and candy. 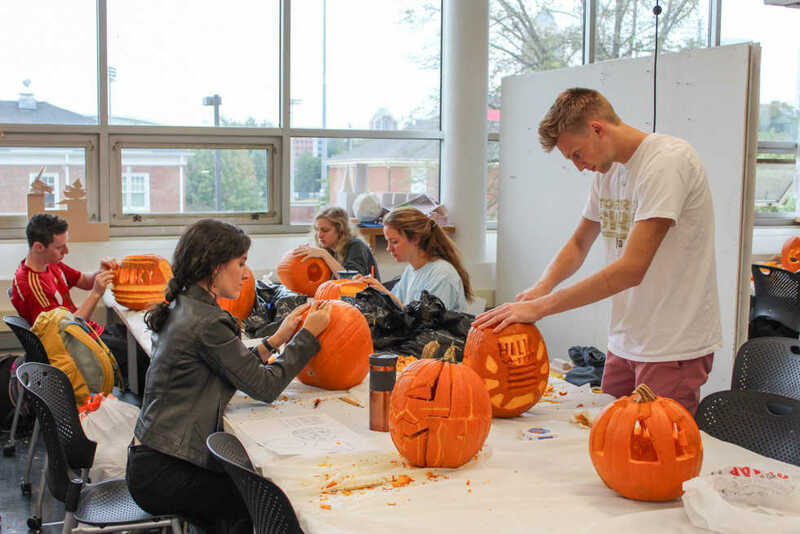 For the third consecutive year, students utilized their spooky season-inspired creativity to design and carve pumpkins in the styles of various famous designers. This project, which culminated in a public display and best-design contest, enabled students to break from the monotony of class and explore novel and exciting ways in which design principles can be applied. “The idea is to take a week off of normal class projects and to do stuff that is a little more fun, but that applies design principles so that students learn a little bit without really realizing it,” said Kevin Shankwiler, professor and undergraduate program coordinator in the School of Industrial Design. Students began the project by dividing into groups and choosing a designer whom they wished to study. After researching the principles and common stylistic choices of each designer, the teams created posters to showcase condensed, easily digestible synopses of the project and what the teams had learned. With the background learning out of the way, the real fun began. Students got slimy and were arms deep with orange pumpkin pulp as they took the design principles and well-known works of their chosen designer and emulated them in their pumpkin carvings. The project culminated the night of Thursday, Oct. 25 with a final judging of the pumpkins. The pumpkins were critiqued by faculty members in the School of Industrial design. Following music, games and snacks, the winners of the Curator’s Award, Best in Show, the best in each design group and the People’s Choice were announced. For the School of Industrial Design, projects such as this one, which seek to reinforce what is learned through conceptual development and practical application, are standard. By taking this approach, students are given the opportunity to apply the design principles and processes which they learn in class and practice them in ways which not only reinforce the concepts, but also encourage them to bend and stretch them so that they can be applied in new and innovative ways to a variety of scenarios and products. Wooten designed her pumpkin in the style of Philippe Starck. “Starck is known for favoring aesthetic over function and likes his work to look dangerous, so I incorporated lots of sharp edges and pointed parts and made the pumpkin unstable by putting it on its side,” said Wooten of her design. Learning however wasn’t limited to just to one’s own artist or just to design principles as first year ID Ian Harmon, winner of the People’s Choice Award, shared. Voters had wandered around during the evening, choosing which pumpkin was their favorite. “I learned a lot about time management and different design styles and how we can incorporate those into our own work,” he said. In the future, Shankwiler hopes to incorporate projects such as this throughout all levels of the School of Industrial design. Through this, students will not only keep the opportunity to have fun while learning, but also be able to share what they have learned with those who are younger and older in addition to showcasing the progress they have has been made. This project shows that the School of Industrial Design sure knows how to create a scary good learning experience that is both fun and productive for its students.